Lawn Maintenance , Landscaping, Fertilization, and Snow Removal in the Racine & Kenosha, Wisconsin area! We are your complete property maintenance company. 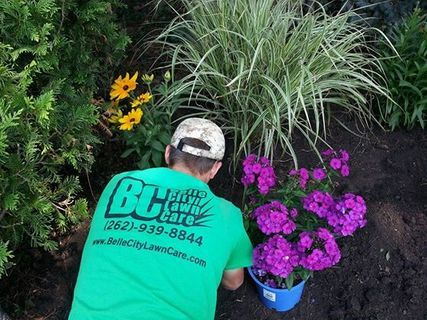 We do it all including: Landscaping, lawn fertilization, lawn care, lawn mowing, snow removal, plowing, and much more! Serving the Racine, Franksville, Sturtevant, Union Grove, Mount Pleasant, Wind Point, Caledonia, Elmwood Park, North Bay, Pleasant Praire, and Kenosha areas for all your Lawn & Landscape needs! Note from Owner: "From day one, my goal has been to provide each and every customer with the opportunity to experience a high quality landscape company for a reasonable price. I strive to make sure each and every job is completed exactly how the customer intends. Our company's Philosophy is to take the steps and time to educate each customer on the procedures, steps, and goals so each project turns out wonderfully. I believe that strong customer relationships are what make a business succeed". COPYRIGHT 2012-2019 BELLE CITY LAWN CARE, LLC. ALL RIGHT RESERVED.